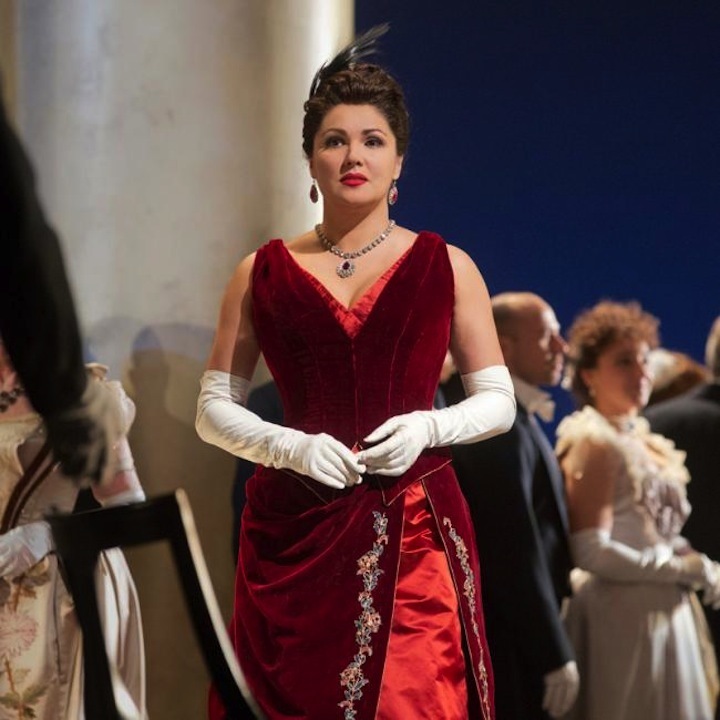 On February 7, Anna Netrebko and Yusif Eyvazov are performing at the Tchaikovsky Concert Hall in Moscow with Vladimir Spivakov and the National Philharmonic Orchestra of Russia. The famous opera couple met in 2014, when conductor Riccardo Muti invited them both to star in Manon Lescaut at the Rome Opera theater. In late 2015, Anna and Yusif got married, and now they try to perform double concerts frequently; not just because they like being together, but also because their voices are a great match. Yusif: Big opera hits. We choose a compli - cated repertoire for concerts: Verdi’s Mac - beth and Il Trovatore, Puccini’s Tosca and Turandot, Giordano’s Andrea Chenier (with this opera Teatro alla Scala recently opened the new season). It’s a double concert, so we need balance. Аnnа: I will tell you this, as a singer who’s been on stage for twenty-five years: a tenor’s repertoire is far more striking than a soprano’s. They are kings of small arias: they come on stage, sing for a minute, and the audience is crying with ecstasy. And we have to treasure-hunt for a repertoire. Yusif: When a tenor sings high-pitched notes, he makes listeners ecstatic literally on the physiological level – I guess, it’s a cer - tain vibration working. Аnnа: All tenors are slightly crazy, you know. They keep singing and singing in - to their head resonator, and then they get weird... (She laughs.) I got lucky, my hus - band is pretty calm, but some tenors out there are truly crazy. Is it harder to perform together? Yusif: It’s harder for me to sing with Anya than with others. She is a genius singer, and people start comparing us at once. Especial - ly because I’m her husband. If I wasn’t, then perhaps they wouldn’t. Аnnа: But in concerts we have absolutely equal success. Yusif: Concerts are a different story. What is the difference between a con - cert performance and a theater show? Аnnа: I prefer shows because I’m a child of theater: roles, costumes, lights. But a concert has more advantages because it shows your abilities better. For instance, Manon Lescaut is great for concerts. This part is so hard to sing that any – even the tiniest – movement puts you out of breath. Concerts are easier: you just stand there, open your mouth and sing. It makes for re - ally good sound. Actually, all dramatic roles are like that, you just cannot sing them lying on the floor, it’s nonsense. You need the so-called breath column. Then you can take long breaths, filer un son. This is what I call true vocals. So concert performances are bound to be better in terms of music quality. Apropos Manon: that first production where you performed together is a legend in the music world now. Yusif: A n y a t e l l s m e , “ L i s t e n , I haven’t learned my part yet.” It was like she hit me on the head with a sledge ham - mer. Yusif: As usual with Muti’s rehearsals, there were some forty people in the audi - ence. And if a fly had landed on the floor at that moment, we would have heard it. Be - cause this had never happened in his class before. I remember witnessing Muti fire a singer for making two or three mistakes in a cadenza. Bold move! Anna, have you always felt confident in your profession? Аnnа: I never knew if I could make it or not, even when I was singing on stage already. Things always went faster than I could have dreamed. If I listened to La Traviata or Lucia di Lammermoor at a theater, I thought, “Oh god, I could never sing this.” The fear was there even when Iswitched to dramatic rep - ertoire. Just a few years back I was singing Manon Lescaut, Dalila, and couldn’t be - lieve I was actually doing it. In the same way I never even imagined I’d be singing Wagner one day. How? I always had a light voice, I started with Mozart. Yusif was the one who went straight for Italy, and as for me, I spent quite a while swimming in the French repertoire. I sang a lot of Giuliettas [Editor’s note: in Charles Gounod’s Roméo et Juliette] and Massenet’s Manons [Editor’s note: two operas of this name exist: an Ital - ian one by Giacomo Puccini, and a French one by Jules Massenet]. Only then did I switch to a stronger repertoire. After Verdi you must have not been expecting any difficulties when you and Yusif recorded that Romanza album with songs by Igor Krutoy. Yusif: Many of these songs are comparable to arias in complexity and vocal skill. Аnnа: These songs are amazing, so beauti - ful and lyrical. I’m sure some of them will be rightfully honored as modern classical music. The orchestra arrangement was pretty serious, too, we were working with the London Symphony Orchestra. The pub - lic will love it. Yusif, have you ever encountered a surprise similar to that C-sharp? Yusif: It was 2009. Carmina Burana. Vladimir Minin’s anniversary at the Grand Hall of the Moscow Conservatory. My agent calls and says, “Do you want to sing? The money’s good. The part is three pages long.” I happily said yes. Time went by, it was soon time to go to Moscow. I opened up the vocal score, started listening. The choir is singing, it’s gorgeous. And then the theme comes on... I had a complete meltdown. But it was too late to say no. I come to the rehearsal, and Minin tells me, “Imagine you are a goose being fried in a pan. What sound would you make?” So now, before saying yes to a part I don’t know, I first study the score and I always prepare in advance. Anna, how do you prepare for your parts? Аnnа: I must know the story, know what each character is saying, including about my character. This builds a picture. If you just learn the music, your phrasing is devoid of meaning, and it should be diverse. Do you now sing love songs with a special feeling? Аnnа: Actually, yes. For instance, we’re singing a duet, and Yusif is trying to kiss me. And he hisses in my ear, “Why are you turning away from me?” I say, “I have lipstick on.” He says, “Kiss others like that!” And we walk away from each other. He was mad. Yusif: It’s a love duet, and she’s offering me her cheek! What am I, your father, brother? Аnnа: Because you will kiss me and smear my lipstick. Then you go off, and I have the whole act to finish! I had to buy kiss-proof lipstick. How do you feel about modern opera productions? Yusif: I’m mostly on the side of classic productions, they feel more true to me. But I don’t mind a modern view if the director has taste, if it’s not visually repulsive. Metropolitan Opera runs this amazing Macbeth production. The Paris Opera has a glorious Eugene Onegin production. Modern, minimalist. Аnnа: Willy Decker’s production. Two walls and three chairs. A genius show, it’s been on for twenty years. While some shows are very expensive to produce, but you come see them just once and never want to return. It feels like in your social network activity, you are true to giving the audience a fairytale. Yusif: If we start complaining about life... People already have it hard, they look at artists for hope, positivity. Very often they write, “I was in a bad mood, saw your post and it made me feel good.” This is what social networks are for. According to your posts, your life is really very eventful. Аnnа: Yusif is even a little tired. I constantly need some fuss. Museums, boats, restaurants, playgrounds, shops, something new every day. Yusif: I sometimes just need a little peace. Lie on the couch, watch a show. It helps me recharge my battery. And Anna just goes off running around museums... I don’t want to, I can only go to a museum when there’s absolutely nothing else to do. How do you feel about traveling? Yusif: Of course, when you fly off for vacation two or three times a year and sit at the office nine to five the rest of your time, then each moment of traveling is happiness. While for us it is pretty routine. I don’t like flying altogether. I’m a Taurus – I need the earth. Could you settle down at some theater? Аnnа: I don’t want to be tied down to only one place. Yusif: My favorite theater is the Bolshoi. I like how it is built, how the changing rooms are made, how backstage works. I always with pleasure say yes to performing there. And I love Moscow, too. Do you ever want to take a break from performing, to get some rest? Аnnа: We are in our prime, our busiest years now. Sometimes I really want to take a break, but I think this is the time for working. In some two–three years we can start slowing down. Yusif: For us work is pleasure, however hard it is. So many exciting invitations, we don’t want to turn any down. But naturally, there will come a time when we have to stop. Maybe then we forget about theater altogether. I, for one, want to open a car repair shop and restore old damaged cars. It’s my childhood dream. Аnnа: And I’ll happily be a home maker. I’ll throw parties and think of ways to spoil my husband’s life. Yusif: Still, I don’t rule out that we wake up one morning six months after retiring... Аnnа: ... and decide to go on a goodbye tour. An endless goodbye tour.